WHAT IS THE HISTORY OF THE SCHOLARSHIP OF HONOR? The award was established in the fall of 2003, with the first award presented in April, 2004 at Wisconsin’s Menasha High School. The scholarship recognizes the accomplishments of two Menasha graduates who received our nation’s highest award for heroism, the Medal of Honor. The program expanded within Wisconsin to honor our fallen heroes who died in Iraq and Afghanistan. Scholarships were soon established in other regions of the U. S., honoring lost service members at the high schools they attended. WHAT IS THE PURPOSE OF THE SCHOLARSHIP OF HONOR? The Scholarship of Honor is an award to honor our military heroes who have given so much for our freedom as we recognize a young man or woman who will be entering the U.S. Armed Forces or a career in public safety or community service. The award is in honor of the example of sacrifice and service set by our past military heroes. WHAT IS THE SCHOLARSHIP OF HONOR CRITERIA? The scholarship is awarded to a graduating senior in high school with plans to enlist in the military, or pursue a career in protective services, including police or fire science, or EMT services; or a career in nursing, teaching, ministry, or public service. IF AN INDIVIDUAL ENLISTS IN THE MILITARY, ISN’T THEIR SCHOOLING PROVIDED? Part of their education may be paid by the armed forces, but the Scholarship of Honor is more than a financial award. It is awarded in recognition of the recipient’s commitment to his or her community and country, and in appreciation of their choice to serve and sacrifice. WHAT IS THE SCHOLARSHIP OF HONOR MEDAL? The Brian LaViolette Scholarship Foundation commissioned a special medal, combining symbolic elements of the Medal of Honor with learning and education. Hanging from a purple ribbon that signifies sacrifice, the Scholarship of Honor Medal is engraved with details about the fallen service member who we honor, the recipient’s name, and the location and date of the award. 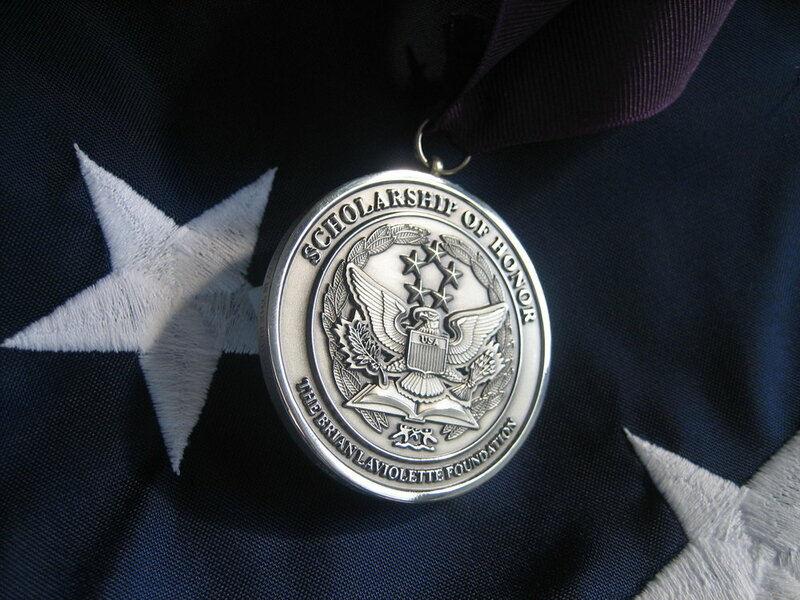 The Scholarship of Honor Medal is presented in a black felt case. WHAT DO THE SYMBOLS STAND FOR ON THE MEDAL? The Purple ribbon is symbolic of the Purple Heart Medal, and indicates sacrifice. WHO DECIDES WHO WE HONOR BY ESTABLISHING SCHOLARSHIPS? Originally established to honor our local heroes, the award was initially intended to honor servicemen and women in the Northeast Wisconsin area who made the ultimate sacrifice for their country. It has since grown to include scholarship recipients in many areas of the country, and the foundation has been asked to help organize and support local Scholarship of Honor programs in cities from coast to coast. The Brian LaViolette Scholarship Foundation officers and directors make the final decision. WHO GIVES PERMISSION TO ESTABLISH A SCHOLARSHIP IN HONOR OF A FALLEN SERVICE MEMBER? The immediate family of a fallen service member gives the foundation final permission to establish a scholarship in the fallen’s name. We do not approach sponsors until we have the family’s permission. WHAT IS THE SCHOLARSHIP APPLICATION PROCESS? Applications are accepted at the high school where the scholarship is established. Interested applicants must complete a three-page questionnaire and 500 word essay. The application materials include information about the individual for which the scholarship is named, as well as the history of the Brian LaViolette Scholarship Foundation. Applications are due on or near April 1 of each year. Typically the award is presented during the graduation season, between May 15 and June 1.
WHO DETERMINES THE RECIPIENT OF THE SCHOLARSHIP OF HONOR? The family of the fallen serviceman or woman is asked to be involved in the selection process. They can make the final decision after reviewing the applications, or by interviewing the applicants, if they wish. In most cases, the family of the fallen, the endowment sponsor, or the school faculty are part of the selection process. WHAT DO THE SCHOLARSHIP RECIPIENTS RECEIVE? The recipients receive a one-time gift of $500.00 to $2,500 at the time graduation, or approximately five percent of the endowment total. The amount can vary depending on the amount of the endowment and the sponsor’s wishes. They also receive the Scholarship of Honor Medal. WHAT IS THE AWARD CEREMONY LIKE? WHO IS INVOLVED? The family of the fallen serviceman or woman is asked to be involved with the presentation. If they wish, they may speak or present the medal and/or check. The award’s endowment sponsor also has the privilege to be in the presentation. If they do not wish to participate, the Foundation or school finds another person to award the scholarship. A presenter’s script is provided by the foundation prior to the presentation. The script includes the background and personal history of the service member being honored and the purpose of the Brian LaViolette Scholarship Foundation and the Scholarship of Honor. If the sponsor is not present, they are also mentioned and thanked for their contribution. WHO MANAGES THE ENDOWMENT TRUST FUNDS? All funds are held in trust in the name of the person being honored, at Nicolet National Bank, Green Bay, Wisconsin. Medal of Honor Recipients Kenneth E Stumpf and Elmer Burr, who attended Menasha High School in Menasha, Wisconsin. Army Spc 4 Nichole Marie Frye, Lena High School, class of 2002. Lost February 16, 2004. Marine Pfc. Ryan Jerabek, Pulaski High School, class of 2003. Lost April 6, 2004. Marine Cpl. Jesse Thiry, Luxemburg Casco High School, class of 2000. Lost April 6, 2004. Army Pfc. Isaiah Hunt, Bayport High School, class of 2002. Lost November 15, 2004. Navy Corpsman John Bradley ,WWII Iwo Jima Flag Raiser, Appleton WI. Army Medal of Honor Recipient, SSG Sal Giunta in honor of Sgt Josh Brennan and SPC Hugo Mendoza, JFK High School, Cedar Rapids Iowa. It is the Foundation’s goal to have $20,000 in long-term endowment capital held in trust for each Scholarship of Honor. This amount will support a minimum annual scholarship award of $1,000. Major individual sponsors or community-wide fundraising efforts are needed to support the Scholarship of Honor. Payment to an endowment can be made over a two-year period. Once the scholarship is fully endowed, the award will be presented annually. Donations can continue to be made to certain scholarship funds to help increase the annual award amount. The Weyers Family Foundation of Green Bay, WI contributes $200 a year for the first 20 scholarships to help cover the cost of the medal, the engraving, and administrative costs. They have also provided a special grant to establish each Scholarship of Honor program. WHO MANAGES ALL THE DETAILS OF THE SCHOLARSHIP OF HONOR? Kim LaViolette Mosteller, Brian’s sister, is Executive Director of the Brian LaViolette Scholarship Foundation. Kim, the former Community Director of the March of Dimes in Asheville, North Carolina, brings experience, skill, passion, and love for her brother to the important mission of the Foundation. The Foundation has two locations in Green Bay, Wisconsin and Asheville, North Carolina. The Scholarship of Honor is recognized by the United States Patent and Trademark Office and is protected by trademark number 3,082,906, issued April 18, 2006. You will find on each Scholarship of Honor page, our generous sponsors under 'star' ratings. Thank you to all who make these everlasting tributes possible. The International Scholarship of Honor is simply an extension of the Scholarship of Honor Program, recognizing youth from around the world for their commitment to community, world peace, and education. To establish a scholarship abroad, we require you have a good relationship with an individual or group to help coordinate the logistics and follow-up details. Currently, we present awards in Poland, South Africa and the Czech Republic. To send us an email, please use our convenient on-line form.